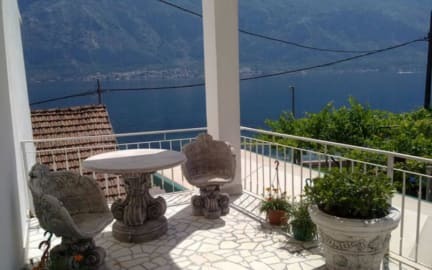 Adriatic guest house is located 6 km from Kotor old town. Our the greatest advantage - house is placed by the coast, It is between 2 great restaurants and 400 m from us is tobacco shop and supermarket. Whole this area is beautiful for exploring by foot or by bike or kayak. Its unique mix of old stone houses by the coast and new buildings behind. Closest restaurant Marius is 50 m. Local bus goes to Kotor once per hour (1 Eur/ticket) and stops near the house. Exactlly address is Prcanj 208. For more comfortable stay we offer extra paid: laundry, rent a bike, rent a car, rent a kayak, speed boat excursions, airport transfers and excursions. 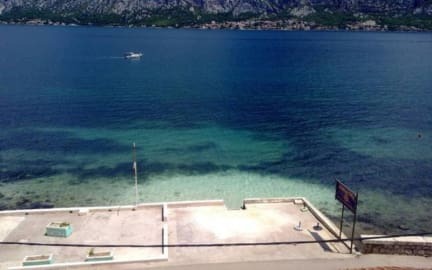 Adriatic guest house has: 3 private twin rooms and 1 double room with sea view and own balcony with plastic chairs and small table, wardrobe, night table, lamp and fan. Rooms are provided with fridge and safe. All this rooms has private bathroom inside. Its provided linen and towels. We also have 3 private twin rooms with mountain view with wardrobe, night table and fan. Its provided linen and towels. Private bathroom for each room, on the hall. Kitchen is shared and equipped with necessary things (big fridge with freezer, toaster, microwave, kettle ). Please have a look at whole floor plan. Free WiFi is provided. There is big balcony with sea view. Smoking is allowed in rooms but using balcony is preferred. Kitchen is shared so please clean it after using. Prices does not include touristic tax.